Welcome to 35 Gleneagles View in lovely Cochrane, Alberta. Gorgeous, panoramic mountain views from here! Great opportunity to get into this 5 bedrm, 3 bath walkout bungalow under $550K. A bit of a 'diamond in the rough', it could use some updating & TLC to return it to its former glory, but wow, what a view! You are greeted by a very open main flr plan with high 14' ceilings, and hardwood floors. The main flr consists of a formal dining room (could be used as office), great room area including a spacious kitchen, sun drenched nook & formal living rm w/ 3 sided gas fireplace. Completing the main lvl is the master suite w/ 4 pce ensuite & walk in closet, as well as another bedrm, full bath & laundry/mud rm area. The fully developed walkout lvl boasts the same views as the main flr, and features a large family rm w/ 2nd gas fireplace & adjacent built-ins, 3 bedrms (2 are quite large & have walk-in closets) and a 3rd full bath. 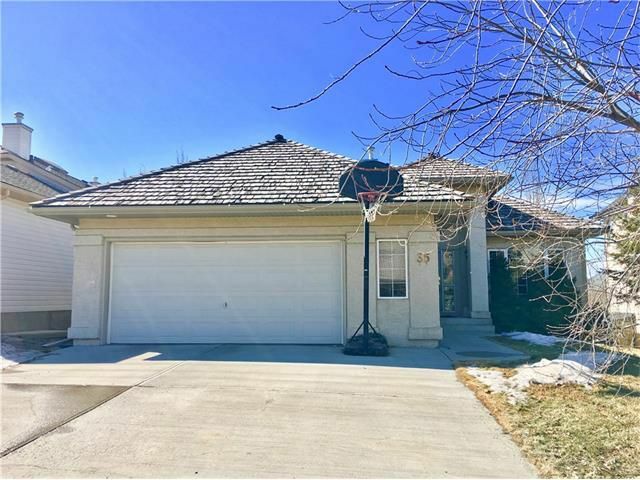 An oversize garage, fenced yard & stucco exterior complete this well priced home.